Disney Wonder is well-known in Key West and Nassau. 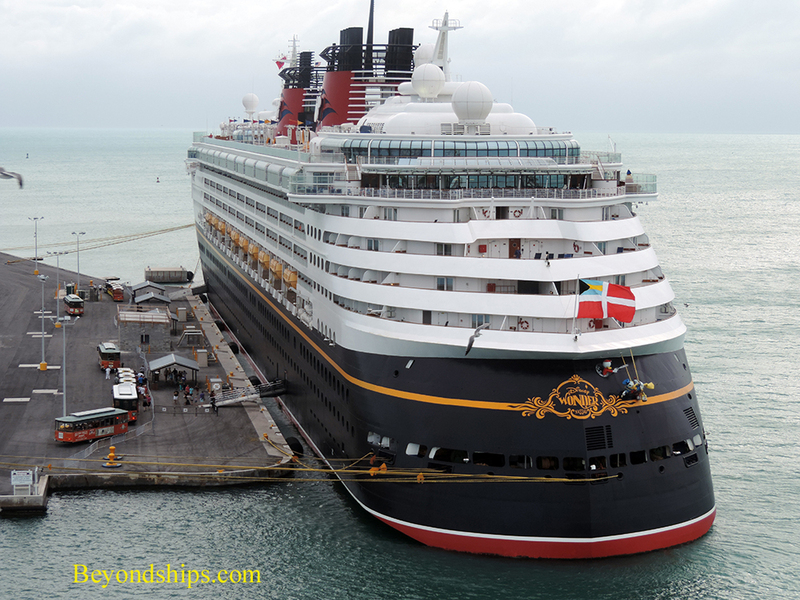 The Disney Cruise Line began by offering short cruises to the Bahamas from Port Canaveral (near the Disney World theme park) and so it is only to be expected that the line's second ship would have been to Nassau many times. Inasmuch as a call at Key West fits in nicely with such itineraries, the ship also knows Key West. These are popular ports and so, even after shifting her homeport to Galveston, Texas, Disney Wonder continues to visit Nassau and Key West. Built by Fincantieri in Italy, the lines and livery of Disney Wonder recall the ocean liners of the past. In fact, Disney Wonder's measurements (length, beam and gross tonnage) are quite close to those of Queen Elizabeth 2. However, she is a modern cruise ship at heart. Her role is not to whisk passengers across the ocean at high speed but rather to provide leisurely vacation experiences. Here, we see Disney Wonder docked at the Navy Mole Pier. Above: Disney Wonder from the landward side. Left: During a brief tropical downpour, Disney Wonder from seaward . Below: A video showing the ship from three sides.